Some of Richmond’s Female Entrepreneurs on Life & Work in the River City. The old adage goes that in life, there are followers and there are leaders — those that are different from the rest, separate because of extraordinary success and drive. In Richmond, these are the entrepreneurs. In a city of budding industry and culture, small businesses have taken on a role of individuality and trust within the community. Women in particular have gained remarkable momentum as business owners in the last few years, overcoming the ingrained prejudices and societal expectations conventionally held for women. In the age of the “Girlboss,” five female entrepreneurs reveal what it is like to be a CEO while balancing families and facing other social standards. Together, these women question the ideals of modern feminism and how the word has come to be perceived today — all while imparting wisdom for any aspiring entrepreneur. “I want to move past feminism as a label,” Kim Mahan, owner of the technology-based company, MAXX Potential, said. “Is there data that shows there is discrimination, yes, but you can’t act on that per se. The most effective way I can help other women entrepreneurs is by being a really good one. Emily Hudspeth, with her choppy, lavender hair, runs the company Real Life Beauty, a hair and makeup service with an intimate storefront. Emily Hudspeth, owner of Real Life Beauty. When asked if she’d describe herself as a feminist, Hudspeth pulled out her phone and showed me the phone case — the words “wild feminist” were inscribed on the back. “Probably,” she said. ‘Maybe a wild one.’” Hudspeth emphasized that being a feminist is not a bad thing, although the word has often been used as a slam. Sandi Cauley, owner of Turn Cardio Jam Studio, leads her fitness classes with a broad smile and an easy laugh. She radiates positivity and respect for others, and expresses her beliefs in the same vein. Cauley, a former executive producer for Channel 6 News in Richmond, is well-versed in leadership. “There’s been a big push for women taking on leadership positions and executive positions and I love that,” she said. “But if you’re going to decide as a woman to leave your job and take care of your kids, to me that’s still feminism — you empowered yourself to make those decisions, and I think that’s fabulous. Like many women in the workforce, Cauley has often struggled with balancing her family and her career. 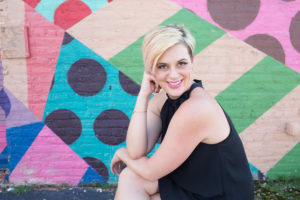 Richmond native Kathryn Starke, CEO of Creative Minds Publications, a global literacy-based educational company, agreed that it is important for women to follow their own path. Starke is a former teacher dedicated to eradicating literacy in inner-city schools nationwide, through teaching reading skills and writing children’s books. For women who want to be entrepreneurs and still have families, Caroline Hutchings, owner of C&C’s Cinnamon Rolls, can vouch for her success in doing so. Hutchings strives to spread sweetness in Richmond with her homemade cinnamon rolls. She plans on passing the secret family recipe on to her daughter. Mahan also grappled with parental responsibilities and career-based ones. As a young, single mother of three, Mahan taught herself to design webpages. Her self-taught skills eventually enabled her to find success in the corporate realm, she said. Today, Mahan runs a company designed to give real-world experience to STEM workers trying to get a job in their field. Behind these five successful women are worn stories of upward battles and epiphanies — their paths have led them astray, but dedication and grit have led them to success. “Everybody has this feeling inside them — this burning, this yearning,” Cauley said. “At the end of the day, we all want to be great. Working at a TV station, I thought that was it. I won the Emmy, I was an executive producer, but I still didn’t feel great. Cauley’s quiet voice filled the silent room — you couldn’t help but listen, her words felt so profound. “Doing what I do now, doing what I love, there’s less salary and less recognition, but now — now, I feel great,” she said. Starke also emphasized the importance of passion in her career. Nidhi Sharma is a University of Richmond graduate & journalist living and writing in New York City. She enjoys writing about science, politics and culture and currently works for an engineering magazine.